Reservations by Subscription – Form enclosed. Dress: Black Tie/ Blazers & Bow Tie Carriages 11.30pm. It is hoped refreshments will be available and the bar will be open from about 4.00pm. The Dinner Committee is much gratified by the splendid response of some 160 Old Members, Friends and Guests, who have already indicated by e-mail their intention of attending. College catering will have to be advised of final numbers by Monday, 20th October. Please note therefore, that seats at dinner can only be reserved against subscriptions, which must be received no later than Friday, 17th October. Those who have already booked flights are asked to act promptly. It is important to make sure that your payment can be identified. Please list the names of any guests, plus your contact details, on the back of your payment or attach to the payment. In the end it was emphatic: Trinity carried off the senior eights title at the National Championships in Farran Wood in Cork on Saturday with a performance which left little room for doubt. A regatta which featured a myriad of composite crews ended with the men in black and white holding off another young single-club crew in Commercial. The composite of Galway, Old Collegians, Shannon and Tribesmen took the early lead, but Trinity passed them and made the race their own by the time they swept past the massed crowds near the striking clubhouse, which came into its own for this event. Commercial’s challenge added a little spice, but there was only going to be one winner. NUIG – who did not lift a single national title – were pushed into fourth by the composite. “It all went to plan,” said Trinity captain Ali Floyd, before paying tribute to coach Mark Pattison. “I always had faith in this crew. I knew they would do what was needed and they proved me right. I’m very proud of them,” Pattison said. It is 27 years since Trinity last won “the big pot” on their own. Their main rivals in the next few years may be the club which holds the far bank at Islandbridge. DUBC arrived in Monkstown last weekend for the culmination of their season’s work in sculls and pairs. Six of the senior squad took part in the time trials for the Home Internationals this year, and both the Novice and Senior Eights raced in their respective events. The novice crew travelled to Cork to race in both the Novice and Intermediate Eights events. UCC gave them a good race in the straight final for the Novice event, with DUBC victorious by nearly half a length. The Intermediate event was a more challenging affair – 2 other crews with considerably more experience were able to handle the difficult conditions better, and while our lads gave a good fight for 3rd place against a similar paced crew, they placed 4th by 1/3 of a length. Two pairs, one composed of Eoin MacDomhnaill and Peter Heverin, the other Sean Osborne and Henry Tindal, also raced. MacDomhnaill and Heverin qualified comfortably by winning their heat, while Osborne and Tindal were lucky to qualify as fastest losers. This put both pairs in the same semi-final 2 hours later. MacDomhnaill and Heverin were again imperious at the head of the field, holding on to win after a fast start. The Osborne and Tindal pairing stepped up their performance somewhat in the semi, the paddle to the start having given them some much needed time on the water. However, the pair could only manage a place in the B Final, which they won in a close head to head with a Belfast Rowing Club pair. MacDomhnaill and Heverin progressed to the A Final just after lunch. Another quick start put the pair ahead by clear water at the 500 metre mark. They settled to their race rhythm and watched the rest of the field through the middle of the race. It was from this vantage point that MacDomhnaill and Heverin saw the famous wind of the experienced lightweight pairing from St. Micks and Neptune. With 15 strokes to go, the field was coming back strongly and it looked like the lighties might have it. Heverin made a call and MacDomhnaill followed, winding the rate up and trying to hold on to the margin. The St. Micks/Neptune pair kept moving on them, but the DUBC pair managed to get in a quick stroke just before the line, and claimed the victory on the surge. This performance earns them a Homes seat, and we all congratulate them on what was an excellent days racing. After a couple of hours rest, the Senior Eight reformed and took to the water to race in a straight final. The ‘quick-start’ took some by surprise, but the boat got up and moving without further drama. At the 500 metre mark it was neck and neck between DUBC, Shandon and a UL/Garda/Skibbereen composite. From this point on, DUBC gradually eased away from the field, with two lengths margin at the halfway, and a couple more by the finish. DUBC are now holders of the ‘Leander Cup’, and will travel to HRR with their race heads firmly screwed on. After a month of exams, injuries and disappointment in Belgium, DUBC produced an encouraging set of results in Blessington this weekend at the University Championships and Metropolitan Regatta. After the cancellation of the University Championships in April due to high winds, the main events were rescheduled for the evening of the 30th May. With many members of the club still in the thick of exams, however, it was never going to be an easy task to get a full contingent on the water. Unfortunately, the DUBC novice men were prevented from racing by the sheer number of exam commitments on the afternoon of Friday, leaving UCD to enjoy a convincing win over Queens in the eights. The senior squad, on the other hand, were not going to be so easily deprived of their chance to get back in the VIII. A highly complex operation including trams, taxi services, and the head coach mending bike punctures at the last minute meant that the bowside powerhouses of Macdomnhaill and Laird arrived at the course with minutes to spare before the final. With just three boats in the race, DUBC were told in no uncertain terms to get in the driving seat from the word go. This they did in style, dominating the race from the first stroke. A punchy 37 from Sean Osborne back in the stern left UCD and NUIG fighting for second place from 500 gone. Coming off the water, thoughts were already turning to the next days small boats races. Just twelve hours after winning the senior eights at Uni Champs, DUBC oarsmen were back on the water in Blessington for Metro Regatta. Strong performances in the heats by the scullers and pairs meant that almost all reached their finals, and anything was possible. Disappointment was in store for the senior 4-, who, stepping into the boat for the first time, lacked the necessary preparation to reach their potential on the day. Similarly, the DUBC Novice men were unable to sustain the pace required to win in the eight. After an impressive start that put them a length ahead of the field, the lack of fitness and cohesion that has resulted from the testing exam period began to show and they were unable to hang on to their lead. Fortunately these are problems that can be solved quickly, and the novice squad are focused on the work that needs to be done to put them back on top. In the smaller combinations, however, months of small boats training through the winter paid off in style. Paul Dunphy, never in doubt as a serious contender for this year’s Novice sculling championship, was only one second off qualification for the Intermediate final, beaten to the line by former novice sculling champion Peter Heverin. In his own category, Dunphy left the field far behind as he cruised home to a convincing victory in the final of the Novice single sculls. Having qualified for the final in the single, Heverin teamed up with Eoin Macdomnhaill to take on the Intermediate pairs final. With very little preparation time, the pair rowed a fantastic race, rowing through their opposition to take gold on the line. In the intermediate singles, three DUBC boats lined up on the start, Heverin having changed straight from pair to single on the slip. Helped by the advantage of the club’s only empacher racing scull, Ali Floyd was able to get in front and stay there. Despite nearly falling in for the third time this week in a large wash in the final 250, he was able to hang on to the lead with Henry Tindal powering through the rest of the pack to take second. The last race of the day, the senior 2-, saw Sean Osborne and Henry Tindal put up an admirable fight against very strong opposition, leaving the 200kgs of Floyd and Laird in their wake and coming in well within touching distance of the pack. After a fantastic performance in this years fitness tests, senior oarsman Henry Tindal was disheartened this week, after a weights session ended in potential disaster. A niggling lower back injury means his appearance in the important upcoming University Championships is in doubt. Nevertheless, in a show of commitment worthy of an elite athlete, Tindal has logged in over 10 incomprehensibly boring hours on the club’s state of the art exercise bike while watching his team mates training on the water from the boathouse balcony. 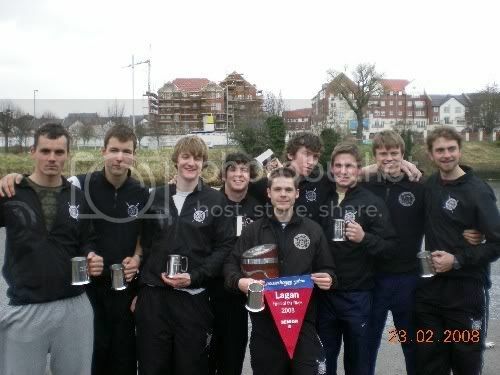 The Senior VIII went to Ghent International Regatta with high expectations after winning Bronze and Silver at the 2007 regatta in the MSA 8+ category. However, the competition was strong and the Senior VIII despite not medaling gained valuable race experience of what standard will be needed to be successful further down the season. In the heat on Saturday, DUBC came second to KR Sport Ghent (BEL) in a close race, and beat Proteus-Eretes Delft (NED) and Vesta RC (GBR) by over five lengths. Despite posting the fourth fastest time in the heats DUBC did not qualify for the five lane final due to its position in the heat. On Sunday in the heats, DUBC beat the previous days Silver medalists, KR Sport Gent(BEL), by one length with a solid performance. The other places in the heat were taken by, Skoll Amsterdam(NED) 3rd, RARC-KAWV/TRT composite (BEL) 4th and City of Oxford BC(GBR) 5th. This automatically qualified DUBC to the final. In the final DUBC met Oxford Brookes University(GBR), Leander Club (GBR), KR Sport Gent (BEL) and Henley RC(GBR). With the hopes of medaling DUBC had a good row, executing the race plan as pre-meditated. The final result however was, Oxford Brookes 1st, Leander Club 2nd, KR Sport Gent 3rd, DUBC 4th and Henley RC 5th. The strength of the opposition was evidently good, but has given the Senior VIII its first taste of what to expect in future regattas as we approach the end of the 2008 season. The next race for the Club will be at Metropolitan Regatta in Blessington on 31st May. Although, the night before the regatta, the Wylie Cup shall be decided with Novice, Intermediate and Senior races in the evening. The Senior VIII will be racing at Ghent International Regatta this weekend, please select and click on the following link for the draw and results –http://www.krsg.be/regatta/. A report of the weekends racing will follow on Monday. DUBC news has now been completed and sent to the printers, the club hopes to have our annual newsletter in the post by the end next week. The 110th Trinity Regatta saw fine weather and a good days racing. At the Luncheon the Captain, DUBC President Robin Tamplin and the Provost were presented with gifts from the visiting Oxford University boats President and Blue Boat cox, Nick Brodie. DUBC Captain then challenged the OUBC President to a race over the Trinity Regatta course, he accepted. The Blue Boat, containing four of the 2008 Boat Race winners and four of the Isis Boat Race winners and weighing in over 15 stone and 6foot 4 a man were evenly match by Trinity’s own colossal boat. 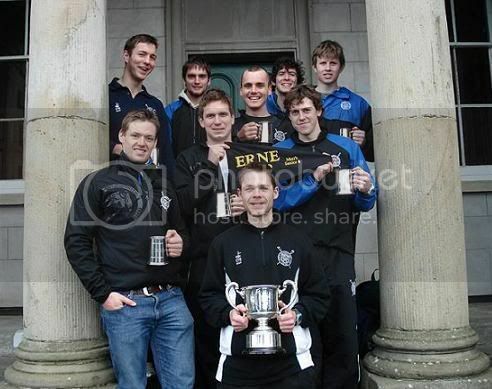 Both crews were well prepared and fully focused on the prize to be DUCAC Oxford University vs Dublin University Varsity Boat Race 2008 winners. Both crews lined up at the start of the historic Regatta course. After the Umpire said go the battle of the titans began, Trinity taking half a length before the first bend, and leading by a length after. At the Boohouse bend Oxford gained a quarter of a length on Trinity but Trinity remained composed on the straight leading to the minute mark. At the minute mark Trinity rating 37 and Oxford 38 had just about clear water over Oxford. Oxford had closed in by Garda Boathouse as the Trinity men were willed by their cox to take the rate up two rating into the 40s. Going past Neptune Trinity lead by 3/4′s of a length. Past Commercial, Oxford drew closer. At the UCD slip Trinity were up half a length and pasted the line winners with the verdict of 1/3rd of a length. A truly momentous race between two ancient Universities and two historic Boat Club’s. Other races in the day culminated in DUBC novices successfully winning the novice category event in style over UCD. The Club would like to thank the Regatta Committee for an exceptionally well run event, DUCAC for sponsorship of the exhibition race against Oxford and the Oxford President and his boat for what was sincerely a memorable day. The senior squad will now prepare for the Belgium National Championships and Ghent International Regatta in Ghent on the 10th and 11th of May. Trinity Regatta starts tomorrow at 9.50am, with a full day of racing till 6pm. Please click on the following link for information about the day’s events,http://acollegemiscellany.com/trpreview.pdf. For students, buses will leave Trinity Hall at 12.30 and College (Nassau Street) at 12.45. There will be a luncheon in the Long Room for old members and friends, following this the DUCAC Oxford vs Trinity Varsity Boat Race will take place at 15.20. Finally, after prize giving competitors, students and friends will convene in the Long Room for dinner with the Oxford Blue Boat. Tickets for the dinner are available costing 20 euro, all are welcome. Following the dinner the day will end at one of Dublin’s frequented nightspots, the Purty Kitchen, tickets cost 7 euro. We look forward to a fun and action packed day! The University Championship of Ireland was cancelled because of high winds. The only DUBC racing was by Doherty who qualified first for the semi-final in Intermediate single sculls and Guildea who also qualified in the same event. Queens Regatta was also cancelled due to high wind. On the second day of racing over the weekend, at Commercial Regatta, it saw the Senior Eight face stiff competition. In the quarter-final a young ‘Old Collegiates’ Crew and in semi-final Commercial of which Trinity were the winners. In the final another match against UCD awaited. After a hard and powerful start by both crews DUBC were slightly ahead by the minute mark, however Trinity hit their stride and powered away from UCD taking the Senior Eights win by a length. A satifying result. However, the Trinity crew will face UCD for the third time in seven days on Friday as well as UCC and NUI Galway at the University Championships. The novice eight will also face UCD again on Friday, after seeing their emphatic victory at Neptune Regatta reversed at Commercial Regatta. Finally, Paul Dunphy set his mark for novice single sculls by a win at Commercial Regatta, we look forward to watching more of Paul racing this year as he sets his targets on novice sculls for the season. Neptune Regatta saw both the Novice and Senior VIII regain form after the loss of the Dan Quinn Shield and Gannon Cup nearly a month ago. The Novice Eight dramatically improved in rythm and style across the day, beating UCD ‘B’ and Garda on their way to the final against UCD ‘A’. The Trinity men gained clear water before the corner when UCD took the advantage of the inside of the bend to regain a quarter of a length, however Trinity maintained its length and composure leading to a victory over UCD of a length and a half. The Senior VIII beat UCD, the eventual winners, earlier in the day by two lengths in a heat, yet were disqualified for steering. Other boats on the water were intermediate sculls which saw no wins. First off, apologies for the delay in updates really, it has been a very busy time for DUBC. The Senior Eight has just returned from London and the annual Head of the River Race there had to immediately prepare for the Gannon Cup, which will take place this Saturday, March 22nd (racing starts at 10:45 from O’Connell Bridge). However, this intense preparation has already paid dividends, as the Trinity Senior Eight placed an impressive 26th at the HORR after starting 79th. A close inspection of the results shows that there were about ten international level crews competing on the day, as well as at least that many elite tideway based squads. So, DUBC is in good company, especially considering the adverse conditions that the high starting number brought with it. It also augers well for the squad when compared to the other GB Universities, as they finished less than one second behind Bristol and ahead of Newcastle. It should be mentioned that Durham University had an outstanding result, finishing in 6th place overall, but this only serves to show the Trinity men how much work is still yet to be done. But, according to local Tideway afficienado Dr. Chris George, DUBC’s performance was ‘unbelievable’ and they should be pleased, but not content. Erne Head of the River, 1/03/08. This past weekend, the DU Boat Club travelled to Enniskillen for the annual Erne Head of the River, hoping to complete what might be described as a double double- winning both Lagan and Erne Head two years in a row. Not happy to rest on their laurels, Coach’s Pattison and Mahony decided to change the crews around, giving returning oarsmen Doherty and Laird a test in the Eight, while also giving Dunphy and Guildea their first taste of Senior Rowing. This also allowed Osborne, MacDomhnaill, Heverin, and Swift to test their skills in the coxless Four on the difficult course. It also meant that, if successful, DUBC would take both the Senior Eight and Senior Four pennant for the first time since 2002. The day of the race saw the Senior squad arrive in Enniskillen in a much more professional manner than at Lagan, and indeed they handled themselves in a manner that befits a Senior squad throughout the whole day. They were greeted with the best conditions of the day for the race, which DUBC old boy and race organizer Robert Northridge attributed to the ‘power of prayer’. After last year’s success, the Trinity Senior Eight had the privilege of going off first and they arrived promptly at the start and made their final adjustments. As always, the race was run in a very professional manner to the extent that DUBC was allowed off a few minutes before the prescribed start time. Anyone who has ever rowed a head race will know that this fact alone speaks volumes about the excellent organization done by Portora and Mr. Northridge. So, without any delay, DUBC wound for the start, crossing the line at 36 spm. After a good hard minute that brought them to the long Killyhevlin straight, they settled into a long, solid rhythm. At this point, BRC, having started second and gone off as near to DUBC as they could, were less than a length behind. Anyone who has followed DUBC during the last two years will know that BRC has developed quite a rivalry with the men in Black and White, narrowly losing the Inter pot two years ago to them and then being pipped on the line by a storming sprint in the last 500m of Queen’s Regatta last year. It is fair to say that they are spoiling for a victory over DUBC, so it is no surprise that they attacked the crew early in the race. However, down the stretch, DUBC remained calm and began to move away with long, consistent strokes. Coming into the second turn, Doherty, in the stroke seat, called for a push and the boys in the engine room responded by increasing the rate and pressure to the railway bridge. BRC seemed to be fading slightly at this stage. Around the big bend, DUBC took a slightly wide course, which could have proved costly, but luckily both BRC and UCD both followed suit. Then, coming into the roughest water of the course, the Eight showed its true form by pushing consistently through the chop, with the Empacher cutting through the waves. At this stage, BRC had spent too much out of the blocks and was fading fast. Meanwhile, coming out of the long bend, the crew had to be restrained from unleashing another mighty push until the rudder was off. Out of that turn, the crew composed itself and then, despite muscles screaming for release, put down the power, though for some, inconsistent training was beginning to show. But all that was left now was a dart around the island and through the bridges. While the crew was tiring, they were not out of fight and the stern pair was anxious for the final sprint. After taking the final bend, the stroke man was given his head and he pushed the rate up to 37 spm for the final run in. The crew crossed the line at full tilt, in a time of 19.15. This was the fastest time of the day for the second year running, completing the double double. It was also roughly the same margin of victory over UCD as at Lagan, whose time of 19.32 was just faster than BRC at 19.35, though no doubt BRC paid the price for trying to run with the big dog during the first 2k of the race. The results were not as good for the rest of the Trinity men competing on the day. The coxless Four, who stormed off the start and took the first 2k in a style that seemed to please Coach Pattison, were impeded by a Commercial coxed Four around the big bend. They had to stop their boat, so the time they recorded is not an accurate reflection of their capabilities. Similarly, the Novice eight, while beating their UCD counterparts by 13s in a time of 21.16, also had a collision that stopped their progress. It is impossible to know how much time was lost and to therefore accurately judge them against Queens, who won the Novice category. THIRD SUCCESSIVE WIN FOR LONDON R.C. “London Rowing Club, with Alastair Graham, the former Oxford University Boat Club President, rowing at No. 3, won the head of the River Thames championship from Mortlake to Putney on Saturday for the third year in succession in 19 mins. 12 secs. Pembroke College, Cambridge I., were second, and Thames II. were third. Eight-one crews started, and in finishing fifteenth the Trinity College, Dublin, crew put up a splendid performance. The conditions were far from pleasant, the water being choppy. The eighty-one crews were sent off without a hitch, the organization being perfect. It is a significant fact that eighteen crews all did faster times than either Cambridge or Oxford during their recent full course trials. Trinity started twenty-second crew in the first division, with Emmanuel (Cambridge) behind and Thames R.C. III., stroked by J. Beresford. sen., in front. After twenty strokes the Irish crew drew level with Thames and at Barnes were clear. Then Emmanuel drew past Thames and challenged Trinity. Then ensued a terrific struggle. The Cambridge crew, which was beautifully together, and is, incidentally, head of the river at Cambridge, began to draw up gradually, but the Dublin crew spurted hard and drew away. Both crews raced thus for about a mile, but at Hammersmith the Cambridge crew drew level, and after shooting the bridge Trinity were slightly behind. At Harrods, Trinity drew up on No. 18 and both crews races neck and neck for about two minutes, after which the Irish crew drew away. Here the water became very bad, and the Trinity cox kept close, rather to close, in fact, to the Surrey shore. At Beverley Brook Trinity spurted hard for the finish and passed no. 20. The Irishmen reached Putney Bridge in 20 minutes, 11 seconds, thus doing a faster time than either of those returned by Oxford or Cambridge during the week. The tideway critics were loud in their praise for the Irishmen, who had jumped up eight places, thus obtaining the title of 14th crew in the British Isles- no mean achievement. This week we take a look at some more recent history. Many may still recall the famous ‘Egyptian Tour’ that the Boat Club participated in during the late 70′s. For those who are not aware, below is an excerpt from DUBC News, 1977 detailing the first of these trips. “It really wasn’t an expedition just to discover the truth about the Sphinx, the Camel et al, but rather an invitation from the Egyptian Rowing Federation that brought DUBC to the Nile! The official invitation came to the Irish Amateur Rowing Union for a representative Irish University crew to take part in two Regattas in Egypt, now an annual event, between 20th and 28th December last. This was the first time an Irish University crew was to compete, joining crews from Oxford, Harvard, France, and Egypt. In a row off between DUBC, Galway and Queens on Blessington Lakes on December 4th DUBC came home by two lengths over Queens to win the right to travel. The crew then travelled to London where they joined up with the Harvard and Oxford crews, and the combined party flew from there to Cairo. The first race was held on December 23rd over a 2000 metres course at Ismailia. Six crews took part, the visiting crews being joined by two local Egyptian crews. The race was close and Oxford won by half a length from Harvard with Trinity third a further length behind. Following this there was a break for some less strenuous activity, Xmas Day being spent sightseeing in Cairo- a far cry from Carols and Xmas Pud! The second race, in Cairo on December 26th, was again over 2000 metres, with again six crews- a Cairo Police crew replacing a composite crew that had raced in Ismailia. The race was again close with little separating the four visiting crews and the Cairo Police throughout most of the race. The French crew won by a canvas from Oxford, with Harvard third and Trinity fourth followed by the Cairo Police. Four seconds separated the first four crews. This past weekend DUBC competed in the Lagan Head of the River in Belfast, entering a Senior Eight and two Novice Eights. For the second year straight, the Senior Eight was the fastest crew, taking the Head pennant in a time of 16.04, with UCD finishing second 13 seconds behind and BRC 20 seconds slower. Both Novice Eights also performed well on the unfamiliar course, with the ‘A’ boat only four seconds behind their UCD counterparts, though the Queen’s novices took the category on their home course. Both results bode well for the Gannon, although the Senior men did not feel that they performed up to their potential and believe that they should have left UCD much further behind. The novice result, however, is encouraging, in light of the slight steering errors that delayed the crew during the race, suggesting the potential for a better time. DUBC Senior Eight (l to r) Tindal, Floyd, Heverin, Kerlin, Magee (cox), MacDomhnaill, Calnan (captain), Osborne (stroke), Swift. Last Monday I presented the first part of an article detailing the ea.rly years of the Club. Today, we have the conclusion to that piece, from The Irsih Times, May 17, 1932. D.U.R.C. had a professional trainer, G. Williams, of Manchester, for the first time in 1859, and a representative crew tried to carry off the Glenbrook Cup again, but the University and City of Cork boats sank, and Cork Harbour barely managed to keep afloat to win. In 1860 the University crew visited Belfast, but were beaten on the Lagan by the Clyde Amateur Rowing Club. At this point, rowing in Cork went ahead, Tom Grant and Tom Peacock being engaged as trainers, while there was considerable slackness in Dublin Bay. Restrictions were put on as to the number of crews competing to make a race, and as there was only one buoy round which all the boats should turn, fouls and disputes were the inevitable consequences. This was remedied years later by laying down a separate buoy for each boat, and, later still, of making each crew keep its own water, or leave it at the peril of being fouled. At the Kingstown Regatta of 1863, outriggers were forbidden and there were three competitors in the four-oared races, D.U.R.C, Liffey and Kingstown. Considerable difficulty arose as to the boats, University and Kingstown starting in gigs, passed by the Committee, while the Liffey men persisted in rowing in a style of boat so extended at the sides as to resemble an outrigger. This was disallowed, but the Liffey men rowed, finished first, and were disqualified. In 1865, D.U.R.C. got the services of Tom Grant as trainer, and a strong crew was got together, consisting of Messrs. F. Patterson, G. Atkins, R. O’B. Lane and George Farren, with E. Dillion or J.D. La Touche as cox. Their principle opponents this year were Cork Harbour, consisting of Messrs. C. Drinan, H.D. Brookes, J. Byrne and R. Foley, with J. Drinan as cox. Their first meeting was at Kingstown, and there were repeated fouls at the turns. At the last buoy, when turning, a Cork supporter in a large boat laden with Southerners, actually held the University boat back, and Cork got the lead to win, despite protests. A few days later D.U.R.C. went to Coleraine and beat City of Derry, Bann and Belfast, and going on to Derry they beat the Derry men again. Then, inside five days, they appeared at Glenbrook and beat Cork Harbour, while a week later they were in Belfast, and again defeated Cork Harbour, as well as two Belfast crew and one from Coleraine. In 1866 the D.U.R.C. ventured on a bold experiment by giving a public regatta, and they got a good deal of support, the Board of Trinity College giving ten guineas, while the members themselves contributed ₤95, and Sir Benjamin Lee Guinness and the two county members of Parliament also subscribed. The course was round a turning buoy at the Pigeon House, and Mersey won the open event from Cork Harbour, the heavy D.U.R.C. being last. In 1867 an event occurred in the D.U.R. Club that would have crippled any other club in Ireland for years. A secession took place of a very large number of members who formed the Dublin University Boat Club. 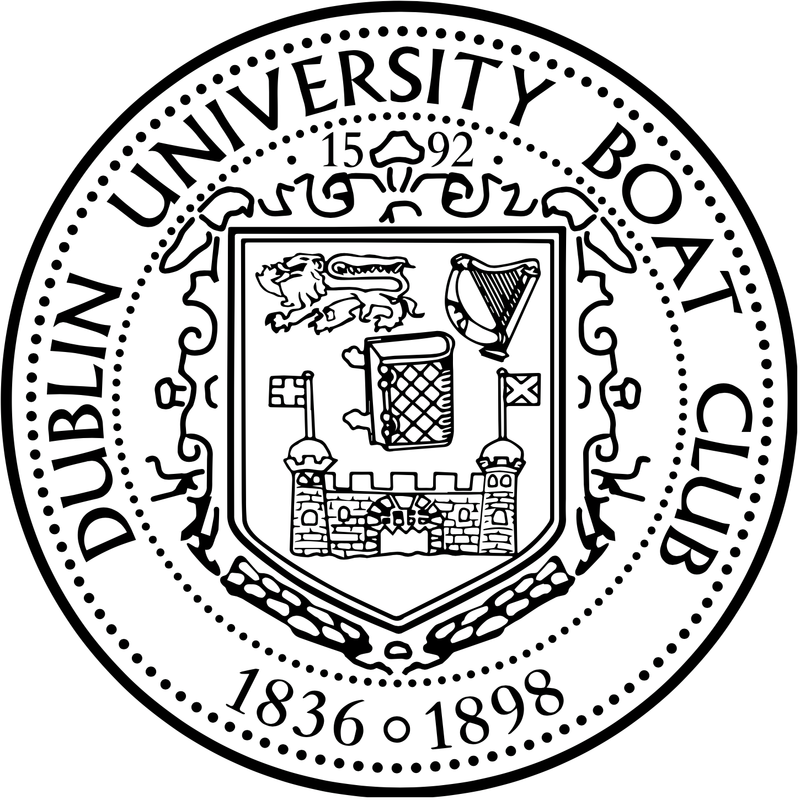 A momentous event occurred in 1869, when the Dublin Metropolitan Regatta was established by the University Boat Club- the new body. The rowing club declined to take an active part, but subscribed ₤25 towards it. The regatta was a great success, and Cork Harbour carried off the first Metropolitan Cup of one hundred sovereigns, over a two and a half mile course. The second Metropolitan Regatta was also a success, and the Henley crew of the Boat Club won the Metropolitan Cup. In 1871 George Wakefield was trainer of the rowing club, and R. Labatt won the Senior Scullers’ Cup for the championship of the Clyde at the Scottish National Regatta, but it almost seemed as if there would be no Metropolitan Regatta, as the boat club had declined to take it in hand for the third time. The Rowing Club then took it over, the members subscribing ₤50 and altogether ₤553 was collected. The Rowing Club won the Liffey Cup, but was beaten in the final of the Pembroke Cup (for eights- the first on Irish waters) by the Boat Club. At Glenbrook Labatt was beaten by G.H. Pentland for the sculling championship of the Lee, but won the senior sculls at the Boyne, beating Ivor McIvor. J. Coxton, of Sorbiton, was the Rowing Club trainer in 1872, and the Metropolitan Regatta was under the management of the University Rowing Club. The Dodder Cup (for amateur oarsmen who had not attained their majority) was added this year, but Rowing Club were beaten in it by Neptune. The Rowing Club four- R.S. Cochrane, G. Patterson, R. Labatt and J.H. Cathrew, with E.K. Byrne cox- were beaten in the final of the Metropolitan Cup by Boat Club, but won the Liffey Cup, and A. Houghton won the Junior Scullers’ Cup. The University Rowing Club had no share in the management of the Metropolitan Regatta of 1873. They had not only resigned, but had refused to have anything to do with the meetings, though they had the Challenge Cups and ₤114 in hand. An equal representation of each club on the Committee was demanded, and refused by a large majority of the members who were not belonging to the U.R.C. The Boat Club and Neptune representatives then retired from the Committee, and an angry newspaper war arose, resulting in the withdrawal of the Rowing Club from all participation in the organization of the Regatta, and handing over the Cups and money to the new committee. Some important changes were made in the conditions of the Regatta. The distance rowed for the Metropolitan and Liffey Cups was reduced to a straight course of a mile and a quarter, the same as at Henley, and the Pembroke contest was no longer rowed in heats. 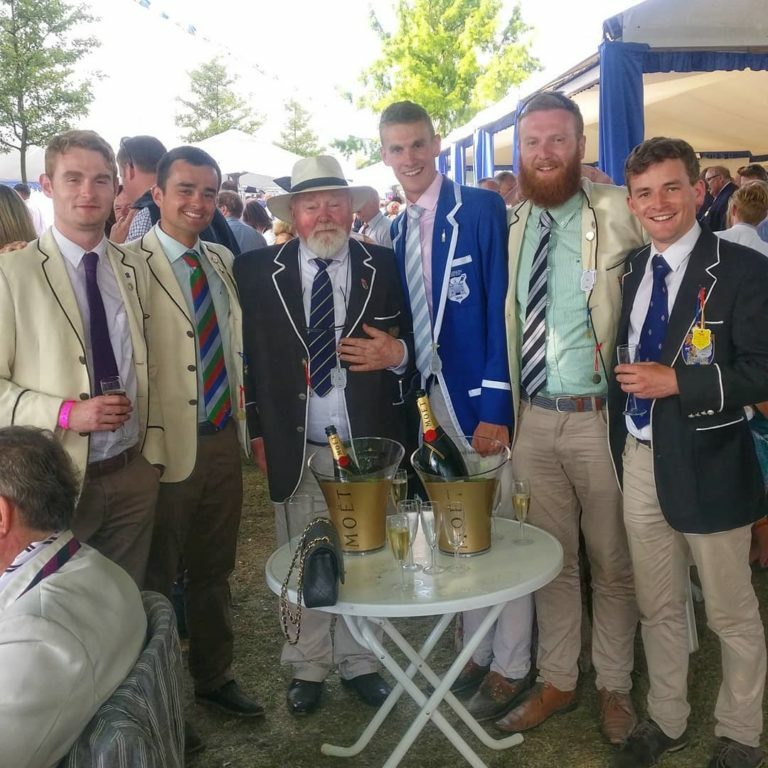 The first four of the Rowing Club own their heat against Cork Harbour in the Metropolitan Cup, but were ultimately beaten by the Kingstown crew, fresh from winning the Wyfold Cup at Henley and the Chester Cup on the Dee. This past Saturday, we once again held our annual Trial Eights dinner. It was, once again, a thoroughly enjoyable evening and a briliant succcess. Well done to the Captain and his committee. Congratulations are also extended to Eoin MacDomhnaill who was awarded the Pineapple Cup as the Club’s fastest sculler. He was also presented with the Senior Zephyr formerly belonging to James Lindsay-Fynn, which the World Champion asked be given to this year’s fastest sculler. James also donated his old novice zephyr and asked that it be presented to the first year novice with the best erg score. Accordingly, it was presented to new oarsmen Danny Ryan on the night. I’d also like to thank all the past members who were in attendance on Saturday, your presence definately added to the club spirit and made the night even more memorable. Now, having just celebrated one of the Club’s best traditions, it seems appropriate to present a long article on the founding of the club, in two parts, from the Irish Times, May 17, 1932. Most of this infromation is available in Ray Blake’s excellent history of the Boat Club “In Black and White” (copies of which are still available upon request). However, there are some very interesting details given regarding the activities of the Pembroke Rowing Club, of which much less is known. With another rowing season just opening, some notes on the history of the sport in Ireland may be interesting to oarsmen. Previous to the year 1830, rowing, as an amateur pastime, was almost entirely unknown in this country, and to the old Dublin Univesrity Rowing Club, known as the ‘Royal Blues,’ must be given the lion’s share of the credit in fostering the sport in its early days; and we find that the first rowing club having a habitation and a name was established at Ringsend in 1833, under the title of the Dublin Rowing Club. A club rarely progresses unless there is keen competition or generous rivalry, and the Dublin Rowing Club had to content itself with practice and mathces amongst its members. For some cause, a number of members seeded in 1836, and formed themselves into a seperate body, called the Pembroke Rowing Club. Rivalry added to the frequent mathces that took place between the parent club and its offshoot, but the latter had for a number of years the balance of defeat recorded against them. Then the Pembroke Club produced a ‘four’ that for several years swept everything before them wherever they competed. This became known as the ‘Christian Era,’ for, in 1838, the crew consisted of three brothers Christian- George, Robert, and Prowse, who, with Arthur Bushe, senior, made up this formidable ‘four.’ The younest of the brothers Christian, Prowse, was then a mere lad of sixteen, but an excellent oarsmen. In the year mentioned the brothers, with W. Webb as stroke, made their first public appearance at Kingstown Regatta, and won the four-oared race, while Prowse Christian and C. Banks won the pairs. In 1839 there was no regatta in Dublin Bay, but the Christians and Arthur Bushe, senior, won several races and matches over the course at Ringsend, now known as the Metropolitan. Prowse Christian and Bushe also carried away the pair at Oughterard and Galway Bay, and the Prowse Christian and W. Webb formed a pair that had a long sequence of successes. In 1840 the Pembroke Rowing Club held a regatta at Ringsend, probably the first ever brought off there, and the ‘Rover’ was specially built for the Chrisitans, to be used on the occasions, in those early days all rowing boats having a name. Two of the Christians fell ill in trianing, and only George rowed with a scratch crew, to maek a race. In 1841, only the youngest brother put in an appearance on the water, and in the chief contest which the crew enganged they were beaten in the final by a Liverpool crew. In 1842 was formed the four which for years was almost invincible. It consisted of George Chrisitan, W.R. Crosbie, Prowse Christian, C. Bond (stroke) and W. Webb (cox). These won easily at Athlone and took the Cup at Kingstown. Then, joined by R. Christian and J. Baker, they won the six-oared race, while R. Crosbie and P. Christian won the pairs. At that time the ‘Christian’ era was looked on as unparalleled as regards successes of the fours and pairs formed by the above-mentioned oasrmen. The following year they won the principal races at all the regattas near Dublin, and in the pairs P. Christian and W.R. Crosbie conceded fifty yards’ start to all opponents and yet won! In 1844 the Christians intended to retire, but on being twitted as being afraid to meet the Dublin Rowing Club’s crews at Kingstown they went into training, bought a castoff boat called the ‘Flirt’ form their opponents, and at the Regatta they beat the first crew of the Dublin Rowing Club, trianed and steered by Goodman, a London waterman; the Liverpool crew, trained and steered by Kipping, another London waterman; a second D.R.C. crew, a second crew of Pembroke, and the formidable crew of the Smith’s from Athlone. 1846 was the last year which the formidable four appeared in public, the three Christians and Crosbie being pitted against Dublin Rowing Club at Kingstown. They were leading easily when Crosbie fainted from cramp, and, of course, lost. Next day, with Bond in the boat, they offered to row any crew present for any stake, but the offer was declined, and the great partnership was dissolved. About this period the old Pembroke Club gave up its distinctive title and merged into the Dublin University Rowing Club, non-University men of both bodies being admitted, with a number of ‘associates.’ There was a lull in regattas in Irish waters from 1851 to 1858, but in 1851 a new crew was formed in the D.U.R.C., consisting of Messrs. H. McDonnell, A. Bushe (a nephew of the Christians), John and William Keogh, and at the Kingstown Regatta in that year this crew defeated the Dublin Rowing Club on two consecutive days, though the Univeristy Club rowed in a banked and streak-built boat by Searle and their opponents in an outrigger. In 1852 a crew was sent to the Queenstown Harbour Regatta, but it was beaten by a Cork crew known as the Anderson crew, the University being second, a crew of officers (old Etonians), trained by Campbell, a London trainer, being third, in an outrigger, and Dublin Rowing Club being last. The last-named crew consisted of Messrs. Duff, Shaw, Rynd, and Neville. In 1852 the D.U.R.C. crew appeared at Kingstown, Cork Harbour, Dollymount and Ringsend Regattas, and the following year were beaten at Kingstown by the ‘Nemesis’ of Manchester, a Cork crew being third. For some years a cloud hung over rowing affairs, but in 1858, matters brightened up, and the Glenbrook and Cork Harbour Clubs were established in the South. At the Glenbrook Regatta there was a fifty-guinea prize offered, which Bushe’s crew (A. Bushe, E. Cavanagh, F. Moore and J. Keogh) carried off in a banked boat, beating three Cork crews, two of them in out-riggers.”…. Apologies to any regular readers who have been anxiously waiting for this weeks dose of DUBC history. Its a day late, but hopefully it was worth the wait. Below is a report from the Irish Times of June 24, 1857 describing, in elaborate terms, the competition for the Ladies’ Plate in that year. It also nicely demonstrates the respect that Trinity has always received at Henley. This year Trial Eights will be held on the 9th of February in the Boathouse. As this is one of the oldest and best traditions the club has, we really hope that as many members, former and present, can make it. As always, it is strictly black tie with a photo to be followed by dinner. Tickets are avaialable from the Club Secretary at floyda@tcd.ie. With the Novice Men preparing for their first true race of the season at Dublin Head on February 9th, it seems appropriate to remind ourselves of success in that event from the past. Below is a report from the Irish Times of May 22, 1950 detailing the victory over UCD by a Trinity Senior Eight that contained so many excellent oarsmen, including our current President, Robin Tamplin. Also interesting to note is that, at that time, categories were still defined by the type of boat that was rowed (Fine or Clinker, for example). The results show that DUBC were faster than UCD in both boats, not to mention the fact that UCD also had the honor of placing dead last. Dublin University senior eight again won the Head of the River race, which was held over a course from Islandbridge to below O’Connell Bridge, on Saturday. Rowing in a Fine boat, the Trinity crew clocked 12 minutes 44 seconds, which was eight seconds better than U.C.D. senior. Neptune senior crew finished third. 1. Dublin University B.C., crew No. 1 (Fine)- Bow, H. Wilson; T. Kilroy, H. Clark, J.G. Leather, W. Orr, M. Murray-Alston, H.H. Strain, stk., R.W. Tamplin; cox, E. Ward. 12 mins. 44 secs; 2, U.C.D., crew No. 1 (Fine), 12 mins. 52 secs. ; 3, Neptune crew No. 1 (Fine), 13 mins. 20 2-5 secs. ; 4, D.U., crew No. 3 (Fine), 13 mins. 44 secs. ; 5, Neptune, crew No. 2 (Clinker), 13 mins. 54 4-5 secs. ; 6, Portora Royal School (Fine), 14 mins. 10 secs. ; 7, Commercial (Clinker), 14 mins. 28 secs. ; 8, Lady Elizabeth (Fine), 14 mins. 48 3-5 secs. ; 9, D.U. crew No. 4 (Clinker), 15 mins. 12 secs. ; 10, Old Colleges (Fine), 15 mins 12 1-5 secs. ; 11, Drogheda (Clinker), 15 mins. 16 1-5 secs. ; 12, D.U., crew No. 2 (Clinker), 17 mins. 44 4-5 secs. ; 13, U.C.D., crew No. 2 (Clinker), 18 mins. 9 2-5 secs. The latest edition of Trinity News is now available and the Boat Club has, deservedly, recieved a fair share of ink. For those members who are not able to get their hands on a copy, links to the articles are provided below. Monday is here again and that means it is time for another item from the storied history of DUBC. It is only natural that we begin to think about the Gannon Cup, which is quickly aproaching (this year set for the 22nd of March, mark your calendars!). Because of this, we take a look at a preview of the first Gannon Cup race in the Irish Times of June 21st, 1947. Interesting to note the much later date for the race and that it was utilized as preparation for Henley. Also interesting to note that it took until 1947 for U.C.D. to be even considered a potential contender to Trinity, making such a race feasible. University College (Dublin) and Trinity inaugurate to-day what is expected to be an annual boat race as popular here as the Oxford and Cambridge race is in London. The idea of such a race has long been in the mind and, now that U.C.D. have reached the stage of being potential challengers of the supremacy which Dublin University had enjoyed so long, the plan will be brought to fruition. The two crews will race from Kingsbridge to below O’Connell Bridge, for the Gannon Memorial Cup. This trophy has been presented in memory of the late Captain Ciaran Gannon, R.A.M.C., who was killed on active service in Burma in March, 1944. He was captain of U.C.D. in 1938 and 1939, when that club rose to be the premier Irish Club; and the Cup now presented in his memory could not fulfil its purpose more appropriately than as a perpetual challenge cup for the annual race between the two university clubs. The start will be at 2.30 p.m., and as the two crews are trained to the minute in anticipation of their coming appearance at Henley, the race should prove to be close and exciting. U.C.D.- Bow, T. Dowdell (C.B.S., Synge street); 2, P.J. Doherty (St. Columba’s College, Derry); 3, J. Slavin (C.B.S. Newry); 4, J. Hanley (Colaiste Mhuire); 5,B. McDonald (Clongowes Wood); 6, M. McElligot (Belvedere); 7, D. Farrelly (O’Connell Schools); stroke, P. Dooley (C.B.S. Limerick); cox, D. Sugrue (C.U.S.). This past weekend, both the Senior and Novice Squads finished their training camps in Seville, Spain and Cappoquinn, respectively. Both camps were an overall success, with the Seniors logging 40km a day in singles and coxless fours, while the Novices expanded their understanding of oarsmenship along the Blackwater. There was, however, some damage done to the boats in Cappoquinn on the last night, as reported in the Irish Times today. The authorities have been contacted and are making every effort to discover the culprit of this cowardly act. Luckily, the majority of the boats that the Men had brought had been safely stored in the ferryman’s cottage garden and were untouched, leaving only one four damaged, though more extensive damage was sustained by boats belonging to the Ladie’s club. More than the monetary loss and the damage that this incident does to our ability to train for the season, it makes one wonder what type of person would commit such a crime, especially given the longstanding and excellent relationship between DUBC and the Old Blue, Cappoquinn Boat Club. While we may never know the answer to that question, it was clear from the reaction of the many friends of DUBC in the Cappoquinn and Villierstown area that the sentiments expressed by this dirty deed were not shared by the community at large, who have always gone out of their way to welcome the rowers from Trinity. We would like to once again thank the Murrays, Flynns, and the people of Cappoquinn who made this year’s camp an overall success, despite this incident. Clearly, whoever committed this act was hoping for a reaction. I only hope that the perpetrator was awake on Sunday morning to see the response from the boat clubs. While initially he or she may have witnessed the shock and dismay of the rowers upon discovering their boats ruined, he or she would have quickly been dissapointed, as both clubs quickly rallied and put their crews on the water for the final paddle of the camp. Both of the DUBC Novice 8s regained their composure and battled each other in near perfect conditions, splitting a pair of ten minute pieces at race pace.